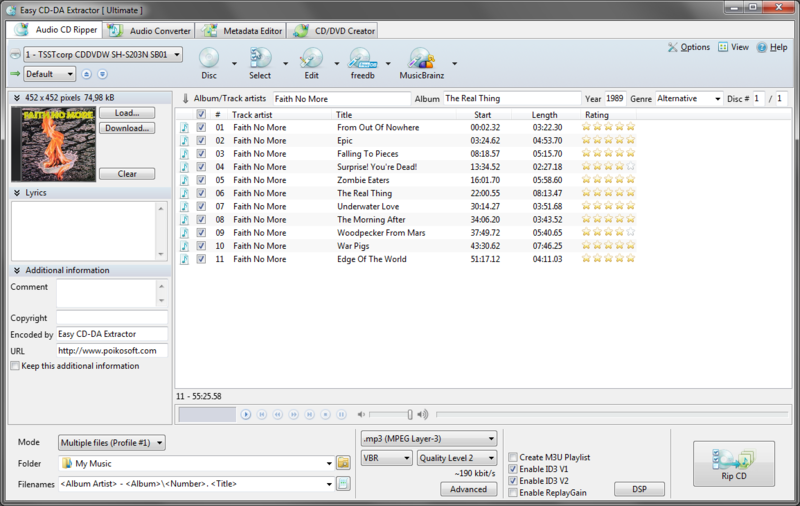 Easy CD-DA Extractor, the Swiss Army Knife Of Digital Audio is all-ine-one music converter that rips Audio CDs, converts audio files from one format to another, edits metadata of audio files and burns Audio CDs, MP3 CD/DVDs, and Data CD/DVDs. You can use Audio CD Ripper to rip CDs to different audio formats. CD ripping is powered by Accurate CDDA that provides accurate, error detective, and high-performance CD ripping. Audio Converter can convert existing audio files to many audio formats. You can edit the metadata of the audio files and write modified metadata back to source files with Metadata Editor tab. Metadata Editor can also download cover art from Amazon store. can be used to burn Audio CDs, MP3 CD/DVDs, and Data CD/DVDs. Make your favorite great-sounding direct digital copies from CDs! Qweas is providing links to Easy CD-DA Extractor 2010.2 as a courtesy, and makes no representations regarding Easy CD-DA Extractor or any other applications or any information related thereto. Any questions, complaints or claims regarding this application Easy CD-DA Extractor 2010.2 must be directed to the appropriate software vendor. You may click the publisher link of Easy CD-DA Extractor on the top of this page to get more details about the vendor.